Let's face it: no matter how "above it all" we would all like to pretend we are, a small part of us eagerly awaits the next juicy bit of Hollywood gossip to come down the line. And some of the more popular sources of that gossip are entertainment magazines such as Variety and the Hollywood Reporter. Which one has the scoop on the best dirt? Let's take a look! Variety is a US-based entertainment-trade magazine published every week. It has actually been around for a while, having been established by Sime Silverman in 1905. Hollywood Reporter is also a US-based entertainment oriented magazine, and along with Variety is one of the two major publications that focus primarily on Hollywood related issues. The magazine was first published in September, 1930, by William R. Wilkerson. Right from the start, Variety has always covered the goings on in the movie, television, theater, and music industries, although it has since expanded its scope to include technology related products and services. The magazine is written mainly for entertainment executives, and it is published weekly to this very day. 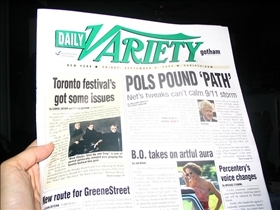 The first edition of the magazine was Daily Variety, and it was later followed in 1998 by Daily Variety Gotham, which focuses mainly on entertainment news in the East Coast. The company behind the Variety has also launched an online version of the magazine, Variety.com. Hollywood Reporter for its part launched the Premier Edition of its magazine in November 2007. Like Variety’s own Gotham edition, the Premier Edition focuses mainly on entertainment news from the East Coast. Variety and Hollywood Reporter have always been involved in some sort of rivalry, with staff members often voicing out critical opinions of each other. It is also interesting to note that personnel from each publication have been known to move to the other, which is easy enough to do given the proximity of their offices to one another! One other interesting difference–and probably the source of much of the competition–is the fact that while Variety is largely seen as belonging to the Hollywood scene, Hollywood Reporter is widely considered to be "on the outside looking in" so to speak. It doesn't help matters any either (at least for Hollywood Reporter) that Variety is often shown or referenced in TV programs and films. To Hollywood Reporter’s credit however, it has been increasingly more prominent in TV programs as well. Which magazine has juicier stories?